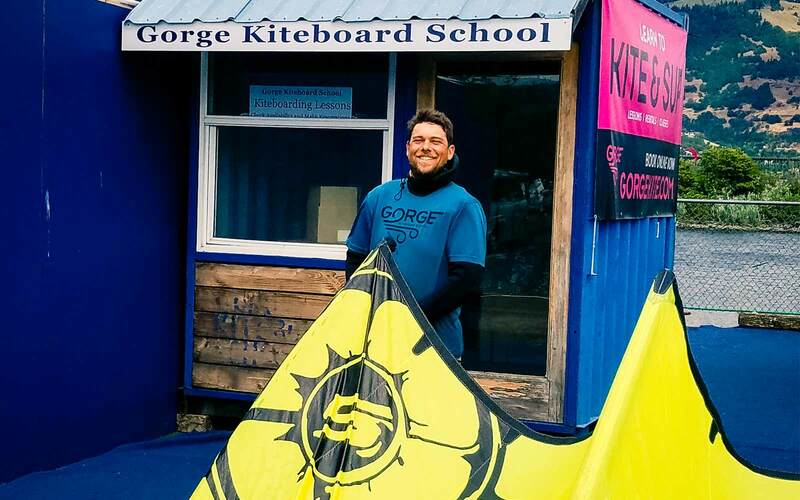 Gorge Kite has been offering kiteboarding lessons in Hood River since 1999 and has earned a reputation as one of the most professional kiteboarding schools in the country. We maintain the school's strong reputation and your safety by bringing our extensive teaching experience to every lesson. When you sign up with Gorge Kite & Sup, your safety is our number one priority both during your kiteboarding instruction and after you are on your own. We are located in the beautiful Columbia River Gorge in Hood River, Oregon. Our school is about an hour from downtown Portland & about 45 minutes from the PDX International airport. Our season runs from approximately April - October although the wind blows nearly every day from June - September. With plenty of lodging close by and our proximity to the Portland airport, the summer in Hood River is an ideal place to learn how to kiteboard. Your lesson with Gorge Kite will be tailored to your experience and skill level. We will utilize relevant skills that you might already have (sailing, surfing, flying, skiing, snowboarding, wake boarding, etc) as well as any kite flying or kiteboarding experience to work toward your goals at your pace.